I have to introduce you to my favorite new thing I’ve been making for the past few months: SWEET POTATO NACHOS. The title is a bold statement, but I think they’re really that good. I’ve made them for a couple of friends at UNC and also for my parents one weekend when I was at home, and they all loved them. My mom has requested them several times since! 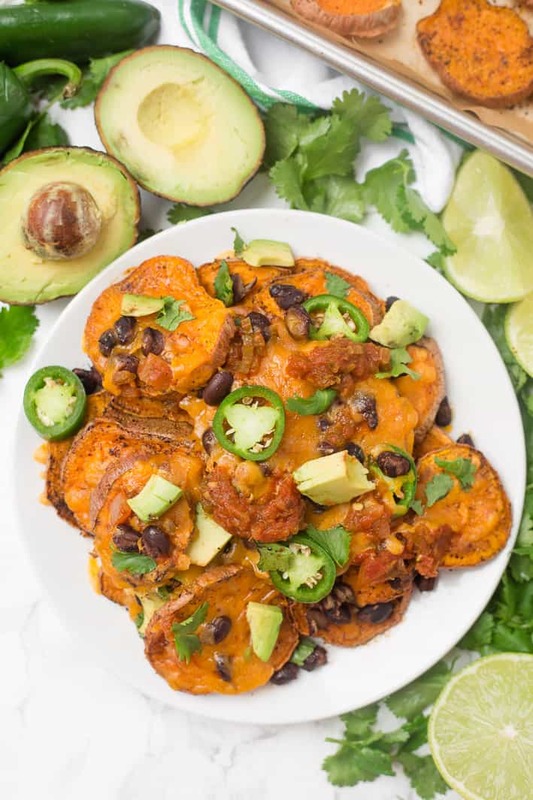 If you haven’t yet ventured into the world of savory sweet potatoes, sweet potato nachos may sound a little crazy, but savory sweet potatoes are actually my favorite. I’d choose these roasted sweet potato wedges or sweet potato chili over sweet potato casserole most days, although I do love them all. 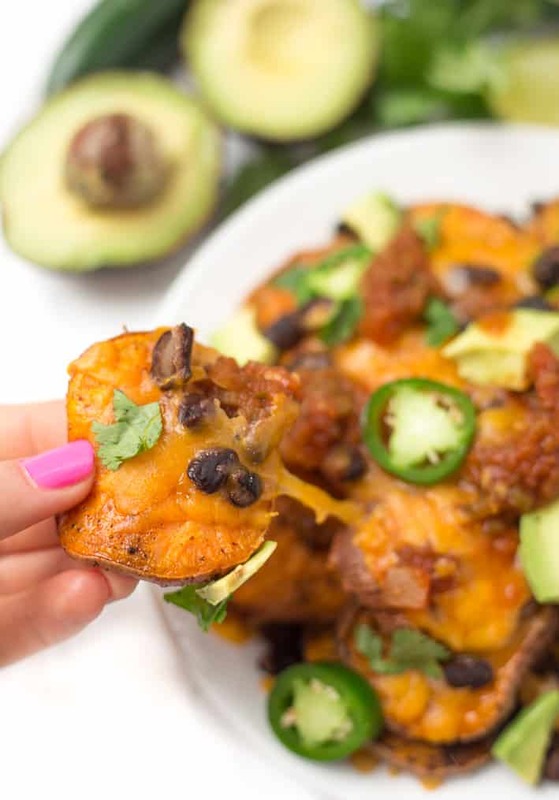 These sweet potato nachos have similar toppings as your typical nachos, but instead of chips, the base of the nachos is thinly sliced, crispy roasted sweet potato rounds! They’re super filling and actually have a decent amount of protein from the black beans and cheese, so I’ll eat them for a real meal. The melty cheese makes them feel super decadent, and the sweet and savory contrast from the sweet potatoes and the toppings is just amazing. I’ve tried these a few different ways and here’s what I think works best: I like to roughly peel the sweet potatoes so there’s skin, but not too much skin. You’ll want to slice the sweet potatoes into thin rounds, but not too thin, because they’ll burn easily and get too crispy. I actually pulled out a ruler and measured (haha) so I could give more specific instructions– about 1/8 inch thick is just right. For any extra-narrow parts of the sweet potato, you can cut them a bit thicker since they’ll cook more quickly. As you can see below, they shrink quite a bit while baking, so make more than you think you’ll want to eat! Line a baking sheet with parchment paper. These are my favorite baking sheets because they’re non-toxic (i.e. stainless steel instead of aluminum), plus they’re big and have these helpful rimmed edges. Then, spread the sweet potato rounds into a single layer and drizzle with oil that’s safe for high heat, like grapeseed or avocado oil. I’ve also used coconut oil in a pinch, which wouldn’t be my first choice, but you could hardly taste it in the end. Then, sprinkle the sweet potato rounds with salt, garlic powder, and chili powder, toss to coat with the spices, and put them in the oven. Flip the sweet potato chips once during baking, and turn on your broiler for the last 1-2 minutes of baking to crisp them up, but keep an eye on them because they can burn quickly. As soon as they’re crispy, (they won’t continue to crisp once you add toppings), pull the sweet potato chips out of the oven. Top with black beans and a generous layer of shredded cheddar, Mexican, or monterey jack cheese. Return the sweet potatoes to the oven for just long enough to melt the cheese. Once the cheese is melted, pull the pan out again and transfer the chips to a plate or serving platter. Or, you can eat them straight out of the pan but be careful since it’ll be HOT. Then, it’s time for toppings! Add dollops of salsa and sour cream/plain Greek yogurt, sliced avocado, sliced jalapeños, and chopped fresh cilantro, and dig in! 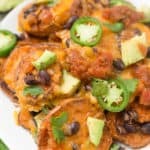 I hope you love these sweet potato nachos as much as I do! If you try the recipe, let me know in a comment or tag me @livbane on Instagram! 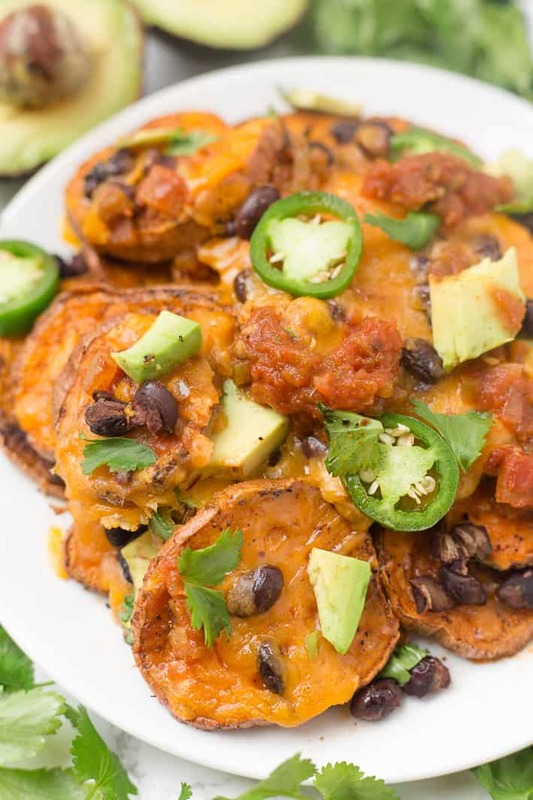 These crispy sweet potato rounds are topped with melty cheese, black beans, salsa, diced avocado, and fresh cilantro! Preheat oven to 425 degrees. Wash and dry sweet potatoes. Roughly peel, leaving some strips of skin on the potatoes. Slice potatoes into 1/8 inch thick rounds. Line a baking sheet with parchment paper. Spread sweet potato rounds into a single layer on sheet. Drizzle with cooking oil and sprinkle with garlic powder, salt, and chili powder. Toss in spices to coat. 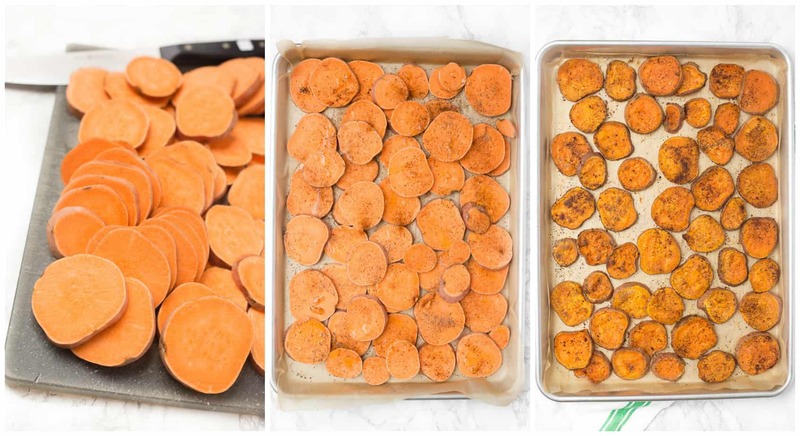 Place baking sheet in oven and cook for 20 minutes, flipping once throughout baking, or until sweet potatoes are soft. Turn on the broiler for 1-2 minutes at the end to crisp sweet potatoes up. Remove pan from oven. While sweet potatoes are cooking, drain and rinse a can of black beans. Once sweet potatoes are done cooking and crispy, top with 1 cup black beans and 1 cup of shredded cheese. Return pan to oven for just long enough to melt the cheese. Once cheese is melted, remove sweet potatoes from oven and top with dollops of salsa, sour cream/plain Greek yogurt, diced avocado, sliced jalapeño, green onion, fresh cilantro, and/or corn. Enjoy right away! These are naturally gluten-free! For a dairy-free version, just omit the cheese. These are amazing! One of my new favorites! 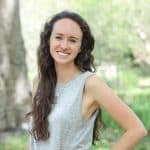 I hope you love these and thanks for pinning, Claire!! I LOVEEE nachos, but I’ve never done them with sweet potatoes or potatoes. I totally believe you 100% that these are incredible, because the cheesiness looks delicious. It’s hard to go wrong with sweet potatoes, avocado, black beans, and melted cheese! Wow this looks amazing!!! I’m so making this asap. What a creative way to eat more sweet potatoes! Hi Naomi! I’d use whatever your favorite type of salsa is! I typically use Kirkland Organic Salsa from Costco- my fave!